With a 36% yield, the solar panels developed by startup Insolight could deliver up to twice as much energy as traditional panels. The company came up with a thin structure that directs the sun's rays to the small surface area of very high performance solar cells. The result is a highly efficient flat photovoltaic system. Twice as much electricity for the same surface area: that sums up Insolight's solar panels. The company, which is based in EPFL's Innovation Park, has developed a prototype with a yield – the quantity of electricity produced from the light energy received – of 36.4%, while solutions currently available on the market offer throughput of only around 18-20%. These results, which could represent a world record, have just been validated on a prototype by the Fraunhofer Institute, an independent lab based in Germany. How did they reach such a high yield? A transparent, flat and very thin optical system made from plastic directs the sun's rays to the tiny surface area of very high performance cells. These cells, which boast a yield of 42%, are made up of a number of layers that were specially designed to capture differing wave lengths. Because they are expensive to produce, these super cells are only used in certain sectors – like space – at this point. So the startup took another tack. 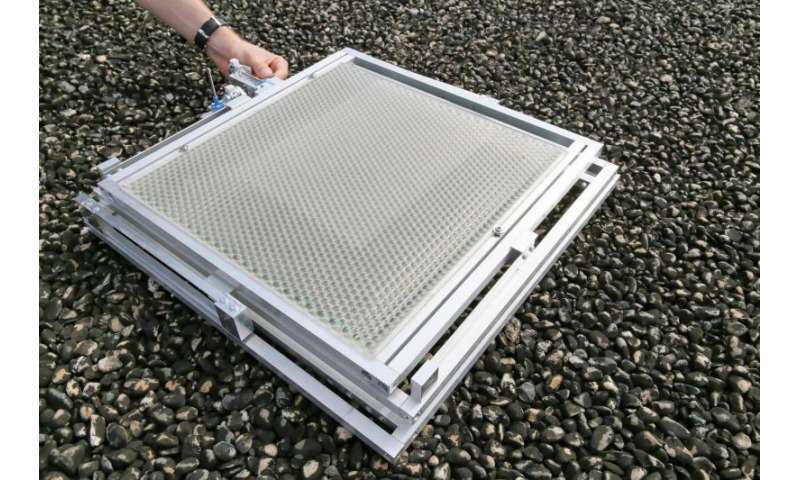 Instead of working to increase the yield of the solar panels themselves, the company uses lenses to focus light waves on small segments of the super cells – segments that are only several square millimeters in size. "It's like a shower: all the water goes down one small drain, there's no need for the drain to cover the entire floor of the shower," says Laurent Coulot, CEO of the startup. The crux of the innovation lies in the microtracking system, patented by the startup, that captures 100% of the sun's rays regardless of the angle of incidence. The transparent plate, which is injection-molded, is equipped with an array of millimetric lenses, which act as a small network of magnifiers. It is moved several millimeters during the day by a metallic frame. This slight movement, which takes place in real time as a sensor detects the sun's position, maximizes the yield. The company developed its innovation in the Laboratory of Applied Photonics Devices under one of EPFL's Innogrants, which go to promising startups. The system takes up such a small amount of space that it can be installed like any solar panel. Christophe Moser made space for the team in his lab and provided them with crucial expertise, as he was developing a solar concentrator for a project to produce hydrogen using sunlight. Insolight's modules could be of interest in that field as well, according to Moser. Similar systems are being developed in several labs around the world, but the EPFL startup pulled off a considerable feat in rapidly producing a system that was nearly market-ready. "All the components were designed from the start to be easily mass produced," says Mathieu Ackermann, the company's CTO. The startup's three young founders are EPFL alumni who all worked in industry before creating their own startup. They began by fleshing out their idea in their spare time before setting up their company. "Working in industry gave us what we needed to reach our goal, which was to develop solar panels that could be rapidly brought to market at a competitive price." The founders are convinced that their solar panels will lower the price per kWh paid by consumers. The system will probably be a little more expensive to buy, "but this will be quickly offset by the additional energy that will be generated," says Florian Gerlich, COO. "The price of solar panels has dropped sharply in recent years, but not enough to produce electricity at a competitive cost," he says. "For residential systems, solar panels accounted for less than 20% of total installation costs in the United States in 2015. Even if the solar panels were free, this would not always offset the system's cost. Currently, most of the margin earned by solar energy developers comes from subsidies. Yet these subsidies are declining." By combining efficiency and ease of installation, the founders of the startup hope to shake things up by making photovoltaic systems competitive with fossil energies. "Insolight has designed a highly innovative system, and these initial prototypes show an impressive yield in external assessments," says Christophe Ballif, Director of EPFL's Photovoltaics Laboratory. "They now need to test the limits of their concept, show how a commercial-sized system can perform, and prove the product's economic potential." The panel requires mechanical movement. My experience says that mechanical panels fail often and that simple, less efficient systems, work much better. Maybe the system could be made even more cheaply if instead of a lens array they use patterned glass (like in a metamaterial). The panel requires mechanical movement. Only several milimeters over the course of an entire day. There's plenty of robust/small/cheap motors that can achieve this without service for decades on end. Depending on the accuracy needed it might even be possible to implement one of the myriad of passive tracking methods available. You don't even need a motor. A coil and magnetic plunger can do the job. You would need a feedback system to keep it in the perfect position, but that is pretty easy to build. And probably needed for the (selsyn*) motor system anyway. A neat way to build in redundancy would be to connect panels in parallel so one or two dead motors would not be a problem. *My father designed a circuit that controlled a carbon arc (sometime in the 1950s) using only one selsyn motor. It monitored the current through the arc, and slowly fed the carbon electrodes together. On startup or if the arc went out, the motor would be driven at maximum speed. That particular circuit would be useless here, but a similar circuit could be designed to maximize the output, and return overnight to the starting position. You really need a high torque low-power solution here such as a motor driving a worm gear. There's plenty of robust/small/cheap motors that can achieve this without service for decades on end. In ideal conditions. Moisture, corrosion, ice and dust are always an issue. A coil and magnetic plunger can do the job. You would need a feedback system to keep it in the perfect position, but that is pretty easy to build. Continuous feedback implies continuous power demand, which negates the energy gains. The mechanism must use next to no energy. a motor driving a worm gear. A worm gear has surfaces rubbing instead of rolling against each other. For 20-30 years, lubrication and wear is going to be an issue. A ball screw would probably work better, if it can be sealed properly. "For residential systems, solar panels accounted for less than 20% of total installation costs in the United States in 2015. Even if the solar panels were free, this would not always offset the system's cost. Residential systems have installation and maintenance costs twice as high compared to utility scale solar, because the systems are spread out and there's fewer panels per inverter and grid tie. Efficiencies of scale and wholesale prices don't work there. The panels themselves are indeed almost insignificant - it's the everything else that makes it expensive. For the utilities as well, backfeeding the grid from a myriad residential panels is more expensive because they have to ensure that the circuit breaking systems work and the local grid can handle the power, and that means more equipment to install and maintain along the lines. That translates to higher transmission costs, and higher price of electricity or monthly fees for the residential customers. I wonder how this compares with what Solyndra was doing? 1.5 meters on a side is over 4 feet on a side, so over 16 square feet. I'd worry about the plastic lenses breaking down in UV light over time. Not many plastics can handle 20 years in full high altitude desert sun and maintain clarity after repeated cleanings. Just look at the headlight lens covers on any newer car. Even if it's a cheap part paying someone to go up on a roof to replace it is going to be expensive. If the range of motion needed is only a few mm it might almost be accomplished with a conductive shape-shifting elastomer similar to what we are looking at for artificial muscles - no moving parts. Piezo positioners could also work with some mechanical amplification. How durable are these panels? What is their expected lifespan? How often does someone have to clean the surfaces? A lot will depend on how the efficiency trails off as the optics degrade under years of UV. It might be a case where a little clouding would only affect efficiency a few percent, or not. 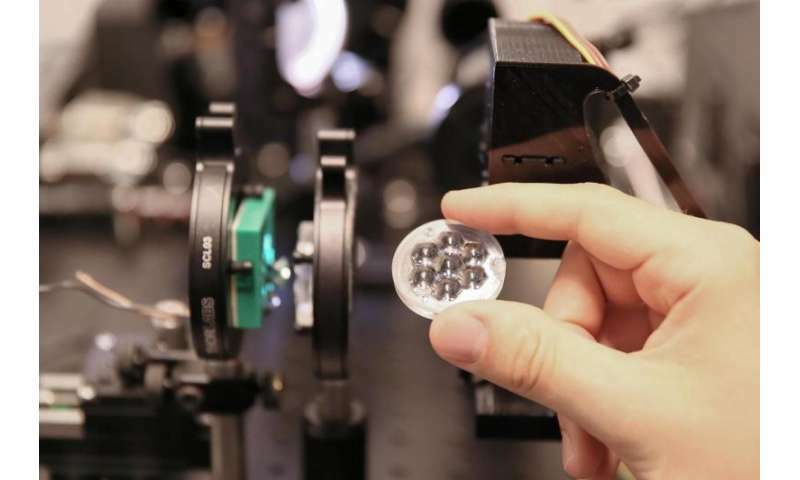 The high efficiency cells might also benefit from improved lifespan provided from precise light filtering via the optics - traditional cells have little of that.